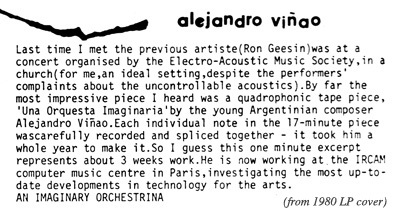 That electroacoustic music concert in a church (somewhere in North London in 1979) was amazingly well-attended; as well as Ron Geesin and of course Alejandro being there, two other stars in the electronic music firmament were present and sparkling. One was a very smart young guy from the Fairlight company (probably Kim Ryrie, one of the two Australian founders), makers of one of the first, and most expensive samplers. He always carried a cool red attaché case such as you might buy now in Shibuya’s amazing Tokyu Hands, so I could spot him a mile off. The other luminary was a man destined to become a Miniatures 2 artist – John Paul Jones of Led Zeppelin. I was impressed to see this rock legend showing so much interest in the cutting-edge technology and music that was on display at this event. Of course Mr. Jones continues his interest to this day, with his recent use of the ultimate software synth/audio processor, the extraordinary Kyma system. Like several other artists on Miniatures, this was Alejandro’s first publicly released work, in spite of the fact that he had already reached a very high level in composition and sound design. Since then, his biography indicates his ongoing progression to higher and higher levels, with various awards such as a Guggenheim Fellowship and numerous composition prizes. With his technical prowess I can imagine that he took to the IRCAM electronic music studio like a duck to water. Quite different to the less-electronic-minded John Cage, who felt intimidated by the amount of equipment in the studio, and dealt with his anxiety by simply taking a sheet of paper and a pencil, and drawing a picture of it. This forbidding high-tech installation then became a toy, something to play with. I tried this drawing approach myself once after installing my first home studio in Tokyo – it really works. Alejandro’s sound world has Argentinian warmth and passion, with its strong use of vocal elements, breath sounds, wind instruments, and resonant percussion sounds such as marimba, often transformed organically by the most sophisticated electronic means available. On that day back in 1979 I could hear the expansive, epic quality of his work, as well as the humanity and approachability of it. He did not breath the icy, elite air that blows around the tops of the ivory towers of such as Boulez, Xenakis, Stockhausen. There always seems to be an inviting, incantatory quality at the core of his works. It never feels cluttered; I think this clarity comes from the time when he created such music by cutting and splicing innumerable pieces of audio tape, in the process of which he actually got to hold each individual sound in his hand. Now, with software and hardware synths, it is so easy to press a few buttons and create complex layers of sound, then layer them even further through multi-tracking, with the risk of filling every little gap in the soundscape. In Alejandro’s music, however, there is space and clarity – somewhat like a Venetian blind or lattice with warm sunlight beaming through it (I came up with this image before knowing that Alejandro has just such an image on his website). For the poster included with the Miniatures LP, I needed a graphic designer who could put together a fairly complex design featuring artworks supplied by all the 51 artists, including Alejandro’s Rorschach-style image. (These days I could do it myself in no time, with Photoshop, but in those days it required real skills at layout, and real paste for pasting!) Alejandro said he had a friend who could do the job. A few days later Horacio Monteverde, a friendly bearded chap wearing full motorbike gear, climbed the stairs to my studio, and right away came up with a simple, effective idea. The poster would be laid out like a chess board, 8×8, with an artwork in each square. It worked just fine, and the empty squares formed part of its classy black background. The other side of the poster was a Sniffin’ Glue (punk magazine) style mess thrown together by yours truly from letters and other material I’d received from the artists. You can download the poster here. 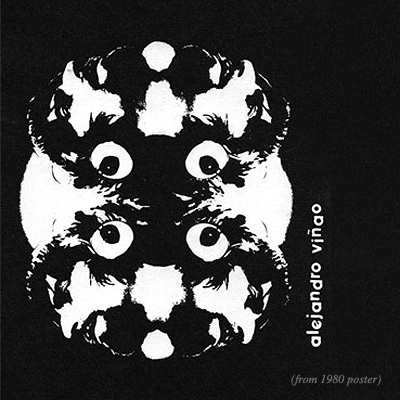 In recent years Alejandro has been writing frequently for tuned percussion, where his long experience of creating electronic music has certainly influenced the cyclic quality of the melodies, the sudden dynamic changes and fluid phrasing. A sensuous and always attractive, entrancing world of sound. See this page for many more samples of his gorgeous work! Next up: the profession of Being.